... if you take a look at this set, you get inevitably astonished. The selection of songs indeed recalls the Abacab-tour, but at a closer look you find out that the mentioned songs were framed by absolute classics and found a fantastic climax in Supper’s Ready. 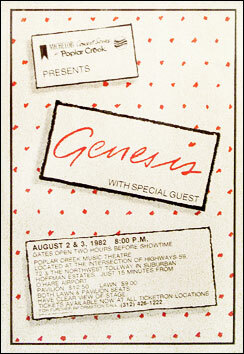 Never before Genesis have presented "old" and "new" songs live so close successive like on this concerts. But there are still other extraordinary things to write about. But first of all let’s talk about the motives for the Three Sides Live-tour (this is the unofficial title of the tour), which found their roots in the release of the double-LP with the same title in June 1982. 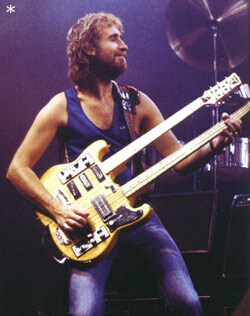 The fourth side was supplied with songs originating from the recording-sessions for Abacab respectively for Duke - except in England. The British fans got something special with pressing live-material of older tours on the B-side of the second record. 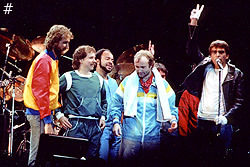 Unusual and unique in the history of the band is the fact that they decided to let a (promotion-) tour follow directly after the release of this live-album. At any rate it’s hardly to ignore that the English version of Three Sides Live has obviously given the incentive to dig up even old classics again and to play them live. Additionally there was an official announcement, Genesis would like to pay tribute to the 10th anniversary of Supper’s Ready and therefore they have included this song in the set. At this place we’d like to give way to the presumption, Genesis wanted to compensate the (after the Abacab-tour very disappointed) fans with the selected songs of the 70s. A short time after the concert-dates had been disclosed an enormous run on the tickets followed. In England for instance more than 500,000 bookings for the shows, which were planned by the group in Britain, entered. 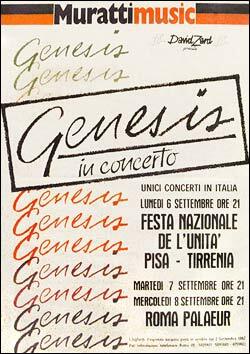 Now Genesis had reached the status of a real top-act, where promoters didn’t had to be afraid anymore of failing inquiries and empty arenas. Concernig the stageshow there haven't been any technical inovations for once, which should come to light at the concerts. The already at the Abacab-tour tested Varilites have of course been used again and some unforgettable moments got created in this way together with the dry ice. Very fascinating effects got created by the application of black light besides. The audience got more than just a couple of colour-spotlights hung up at the top of the stage. The scenery, which acted upon the spectators, was an optical perfectly mounted event, which didn't just accompany the music, but strenghtened its effect. You couldn't expect anything else than having Daryl Stuermer (guitars and bass) and Chester Thompson (drums) again on stage besides Phil, Mike and Tony. In the USA they invites additionally Bill Bruford as guest musician. He had been together with Genesis on tour once before on the A Trick Of A Tail-tour. In New York on 22nd August 1982 there has been a similar unusual event. 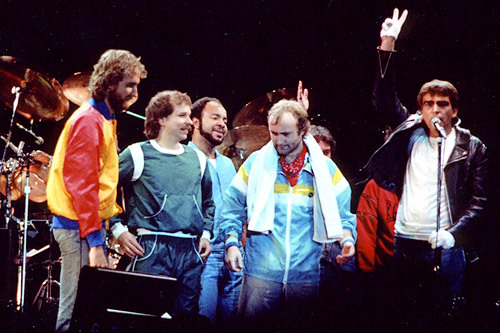 The horn-section of Earth, Wind & Fire have given an unique guset performance there and accompanied Genesis at the songs Paperlate and No Reply At All, which entered the program especially for this show. On all the other concerts in America as well as in Europe they didn’t vary the set. We can say about the musical performance of the songs that the performed versions were taken pattern from he preceding tours and therefore dind't contain any exeptional surprises. But worth mentioning is The Lamb Lies Down On Broadway/Watcher Of The Skies, the respective encore at the appearances. The medley It/Watcher..., which was played on the Trick-tour and released on Three Sides Live, has been the pattern for this new staging. Again, only the instrumental intro and end of Watcher... was presented. A huge concern of the band was to play on this tour in countries, where they haven't played live for many years. So they gave a guest performance even in Denmark and Italy for instance, where Genesis had played for the last time in 1975 on the The Lamb Lies Down On Broadway-tour. In Italy the band had had their greatest successes outside of England in the early seventies, and the frenetic fans thanked them with an unbelievable enthusiasm and three totally sold-out concerts. 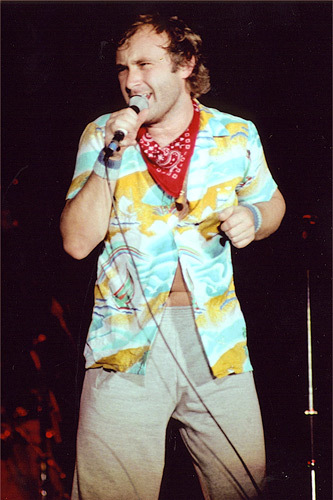 By the way Phil insisted this time again upon telling his little stories, which he had thought out for a couple of songs, in the respective native language. So it took place, too, on 10th September 1982 in the Wilhelm-Koch-Stadion in Hamburg. This concert, which was the only concert in Germany on this tour, is still thought to be as a fantastic occurrence in fan-circles. 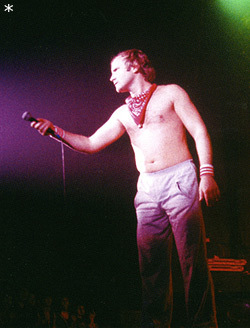 From all over the country the Genesis-followers wandered to the Hanse town and let this show become an extra special cult-event, which was still talked about full of enthusiasm even years later. But also an other, unique musical titbit let this evening become something very special. 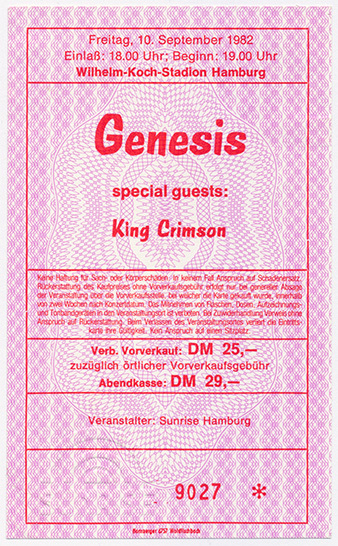 Specially for this show (at Genesis' request) King Crimson, who have been at the same time on tour, was engaged as support. The fascination, which Robert Fripp & Co. did still exert onto Banks, Rutherford and Collins in the 80s, induced them to interrupt an interview, which was even held, to listen to the sounds of King Crimson. But this shouldn’t be the end of the particularities during that year. 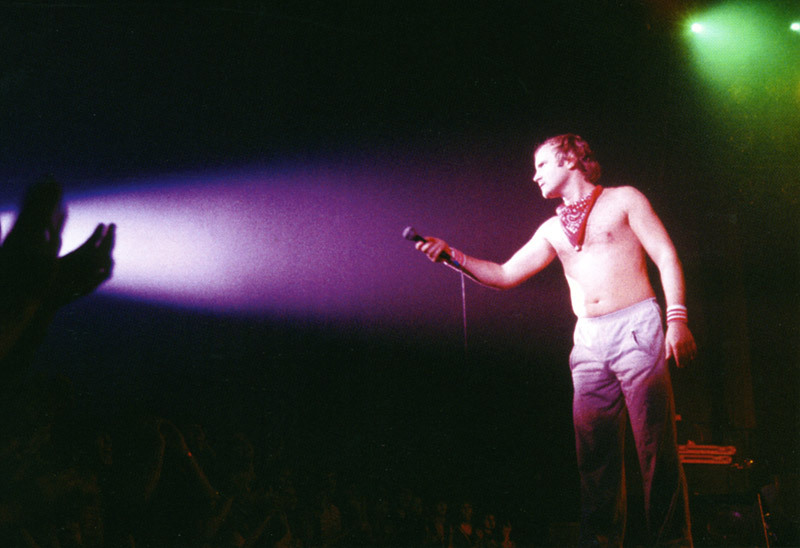 On 10th November 1972 Genesis had played in the legendary Marquee Club in London. On 27th September 1982, nearly 10 years later, this holy halls should be again the scene for an unusual concert. Unusual for that reason, as the group performed under the name of The Garden Wall (one of the two schoolbands, genesis originated from). When the fans got wind of this show, the tickets got certainly in great demand. A lot slept in front of the entrance of the theatre, and the next morning there has been a long queue of waiting fans. Already at 10.30 a.m. the concert was sold-out. Only fivehundred people have had the chance then to get into the club, and there’ve been of course hundreds on this day, who came away empty-handed. But there shouldn’t be any reason for them being disappointed. As the absolute climax of the year 1982 heralded. 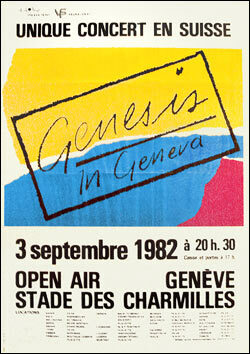 Genesis played again a concert together with Peter Gabriel! How did this come? 1981 Peter Gabriel had launched the organization W.O.M.A.D. (World Of Music, Arts And Dance). Since that time artists from all over the world demonstrate their cultures on the so called W.O.M.A.D-festivals. The first of this festivals took place on 16th and 17th July 1982 in Shepton Mallet. It ended in a huge financial catastrophe and a burden of debt of £ 189,000. 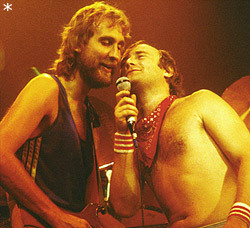 When Genesis heard from their manager Tony Smith of these desaster, they decided to give a benefit-concert in favour of W.O.M.A.D. as the closing of the tour. Peter, who felt jointly responsible for this burden of debt, wanted to participate in this event. 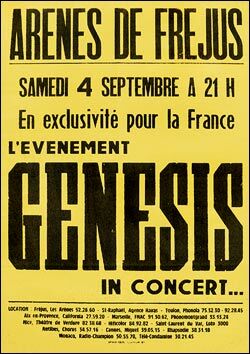 So on 2nd October 1982 a venerable reunion-concert took place, which got into history of Genesis as "Six Of The Best". The rehearsals for this event were held on 28th, 29th and 30th September in the Hammersmith Odeon in London, where additionally the three final concerts of the Three Sides Live-tour took place. 50,000 fans from all over the world did come to the Concert Bowl of Milton Keynes to see the "reunion" of Genesis and Peter Gabriel. before this festival started John Martyn, The Blues Band and Talk Talk performed. At 7 p.m. sharp Tony, Mike, Phil, Chester and Daryl got on stage. Then a coffin, carried by four undertakers, could be seen in the spotlights. The coffin opened, and Peter climbed out off it in the "Rael"-outfit, to start the concert immediately with Back In N.Y.C..
Two hours full of enthusiasm, unique feelings, joy and fascination followed. As the top closing of this unbelievable time-voyage Steve Hackett did also appear to join his former band-colleagues at the two encores. Many thanks to George German for his help with the tour posters!